Catholics will remember St. Francis of Paola on April 2. The saint founded a religious order at a young age and sought to revive the practices of the earliest monks during a period of corruption in the Church. Francis was born in the Southern Italian region of Calabria during 1416. His parents, who maintained a strong devotion to St. Francis of Assisi, named their son after him. The boy's father and mother had little in the way of wealth, but they passed on a rich spiritual heritage to their son, with the hope that he would imitate his namesake. The young Francis showed signs of a remarkable spiritual life, following his parents' lead in accepting poverty as a path to holiness. 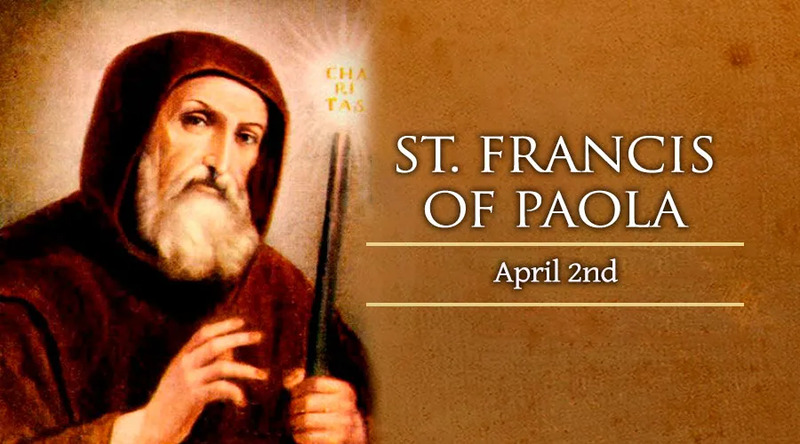 When his father placed him in the care of a group of Franciscan friars to be educated at the age of 13, Francis made a personal decision to live strictly according to the rule of their religious order. in the manner of the earliest desert fathers such as St. Anthony of Egypt. The young monk slept in a cave, and ate what he could gather in the wild, along with occasional offerings of food from his friends in the town. Within four years, two companions had joined him, and the townspeople assisted in building three individual cells for the hermits, as well as a chapel where a priest would offer Mass. With approval from the local archbishop, this small group continued to grow into a larger religious order, without compromising the young founder's insistence on penitential and primitive living conditions. They were first known as the Hermits of St. Francis of Assisi, but later renamed the “Minimi” (or “Minims”), meaning “the least,” and signifying their commitment to humility. Francis and his monks were notable not only for their austere lifestyle, but also for their strict diet, which not only eliminated meat and fish, but also excluded eggs, dairy products, and other foods derived from animals. Abstinence from meat and other animal products became a “fourth vow” of his religious order, along with the traditional vows of poverty, chastity and obedience. Francis instituted the continual, year-round observance of this diet in an effort to revive the tradition of fasting during Lent, which many Roman Catholics had ceased to practice by the 15th century. Ironically, Francis' pursuit of solitary communion with God attracted attention from a range of important figures, including several European kings and other nobility along with Popes and bishops. Some of these men regarded Francis as a spiritual leader in a corrupt age, while others may have been more interested in his gifts of prophecy and miraculous healing. Francis traveled to France at the request of Pope Sixtus IV, taking with him his nephew Nicholas, whom he had raised from the dead. There, the notoriously power-hungry King Louis XI was approaching the point of death himself, and hoped that Francis would perform a miracle and restore his health. Francis told the king bluntly that he should not fear the end of his earthly life, but the loss of eternal life. From that time, the hermit became a close spiritual adviser to the king. He discussed the reality of death and eternity with him, and urged him to surrender his heart and soul to God before it was too late. The king died in Francis' arms in 1483. Louis XI's son and successor, Charles VIII, maintained the monk as a close adviser, in spiritual and even political affairs. Nonetheless, Francis persisted in following the monastic rule he had developed while living in his hermitage outside of Paola. He continued as superior general of the Minim order, and founded new monasteries in France. Francis sensed that his death was approaching at the age of 91, and returned to living in complete solitude for three months to prepare himself. When he emerged, he gathered a group of the Minim brothers and gave them final instructions for the future of the order. He received Holy Communion for the last time and died on April 2, Good Friday of 1507. Pope Leo X canonized St. Francis of Paola 12 years after his death, in 1519. Although the Minim order lost many of its monasteries in the 18th century during the French Revolution, it continues to exist, primarily in Italy.